Home ownership is a key element of the American dream for many, and the U.S. tax code includes many tax breaks that help support this dream. If you own a home, you may be eligible for several valuable breaks when you file your 2017 return. But under the Tax Cuts and Jobs Act (TCJA), your home-related breaks may not be as valuable when you file your 2018 return next year. Property Tax Deduction – For 2017, property tax is generally fully deductible — unless you’re subject to the alternative minimum tax (AMT). For 2018, your total deduction for all state and local taxes, including both property taxes and either income taxes or sales taxes, is capped at $10,000. Mortgage Interest Deduction – For 2017, you generally can deduct interest on up to a combined total of $1 million of mortgage debt incurred to purchase, build or improve your principal residence, and a second residence. However, for 2018, if the mortgage debt was incurred on or after December 15, 2017, the debt limit generally is $750,000. Home Equity Debt Interest Deduction – For 2017, interest on home equity debt used for any purpose (debt limit of $100,000) may be deductible. (If home equity debt isn’t used for home improvements, the interest isn’t deductible for AMT purposes). For 2018, the TCJA suspends the home equity interest deduction. But the IRS has clarified that such interest generally still will be deductible if used for home improvements. Mortgage Insurance Premium Deduction – This break expired December 31, 2017, but Congress might extend it. Home Office Deduction – For 2017, if your home office use meets certain tests, you may be able to deduct associated expenses or use a simplified method for claiming the deduction. Employees claim this as a miscellaneous itemized deduction, which means there will be tax savings only to the extent that the home office deduction plus other miscellaneous itemized deductions exceeds 2% of adjusted gross income. The self-employed can deduct home office expenses from self-employment income. For 2018, miscellaneous itemized deductions subject to the 2% floor are suspended, so only the self-employed can deduct home office expenses. 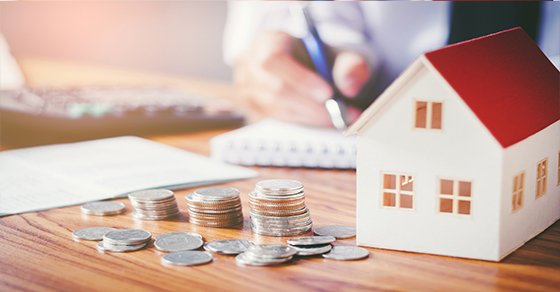 Home Sale Gain Exclusion – When you sell your principal residence, you can exclude up to $250,000 ($500,000 for married couples filing jointly) of gain if you meet certain tests. Changes to this break had been proposed, but they weren’t included in the final TCJA that was signed into law. Debt Forgiveness Exclusion – This break for homeowners who received debt forgiveness in a foreclosure, short sale, or mortgage workout for a principal residence expired December 31, 2017, but Congress might extend it. Additional rules and limits apply to these breaks. To learn more, please contact us. We can help you determine which home-related breaks you’re eligible to claim on your 2017 return and how your 2018 tax situation may be affected by the TCJA.